Almost exactly a year ago, I told you about Newer Technology’s USB 2.0 Universal Drive Adapter, a clever product that lets you quickly and easily access data on bare hard drives—specifically, 2.5-inch and 3.5-inch IDE/ATA and SATA drives, as well as 5.25-inch IDE/ATAPI drives, that aren’t contained in an enclosure. 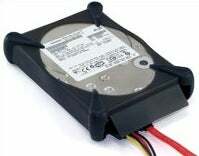 Essentially a connector and a set of cables, the Drive Adapter let you connect a bare drive to a USB port on your computer. It was a handy tool, especially for testing and troubleshooting; it was also useful for copying data from an old hard drive to a new one before swapping them, and for occasionally using an old hard drive without having to buy an external enclosure. And at only $25, it was surprisingly affordable. At last month’s Macworld Expo, Newer Technology announced a new, updated version of the Drive Adapter, technically still called the NewerTech USB 2.0 Universal Drive Adapter ( ) but priced at $30 and offering a new design and a number of improvements. The biggest change is that the Adapter itself is now only 2.7 by 1.7 by 0.6 inches in size and provides four status lights: power, USB, IDE/ATA, and SATA. The lights indicate that the Adapter is getting power, is connected to a USB port on your Mac, and is successfully connected to an IDE/ATA or SATA drive, respectively. These indicators, though simple, help you troubleshoot connection problems. For example, I had a particular 2.5-inch SATA drive that wasn’t appearing in the Finder when connected via the Adapter. The USB indicator was lit, but not the SATA light, telling me that the connection problem was on the SATA side. After removing the SATA cable and reseating it, the drive worked as expected. Newer Technology's original Universal Drive Adapter (left) and the new version (right). On the other hand, in my testing, the lights don't behave as expected. For example, the power and USB lights both illuminate whenever the Adapter is connected to your computer via USB or is connected to the power cable (see below). As another example, when connected to an SATA drive, the SATA light glows steadily, while the IDE/ATA indicator lights up whenever the drive is accessed. This is useful information, but I would have expected the SATA light to indicate data transfer in such a scenario. Another minor issue is that there's quite a bit of “bleed” between the lights; for example, when the USB and SATA indicators are lit, the IDE/ATA indicator in between them also appears lit, if a bit dimmer. Although, to be fair, this light bleeding never led me to misread the indicators. Two other changes to the Drive Adapter itself relate to connections. Although the Adapter still has SATA and IDE/ATA ports, it now has a mini-USB port instead of a captive USB cable; the new Adapter connects to your computer using a removable USB cable (a 27-inch cable is included). The updated Adapter also has a power port that lets you use the included AC power adapter for all drives, including 2.5-inch IDE/ATA drives. (With the original, 2.5-inch IDE/ATA drives were powered entirely by your computer’s USB port.) This latter change resolves one of the issues I had with the original model: a 2.5-inch drive that didn’t get enough power when using the Adapter. Finally, the new package includes a 2-inch ATA extension cable for use in situations where you can’t connect the Adapter directly to the back of a 3.5-inch or 5.25-inch IDE/ATA drive. As with the original version, the kit may look like a jumble of cables when you open the box, but an included flyer tells you which pieces to use, and how to connect them, for each type of compatible drive. Essentially, you connect the Drive Adapter to your drive (either directly or via the appropriate cable); connect the power adapter to the drive (either directly or, for 2.5-inch ATA drives, via the Adapter itself); and then use the USB cable to connect the Adapter to your computer. The drive should appear in the Finder just like any other external USB hard drive. A minor issue I had with the new version of the Drive Adapter package is that its connectors didn’t fit at tightly as those of the original. For example, the IDE/ATA connector on the side of the Adapter unit fit my 3.5-inch drives loosely, and the included USB cable fit the USB ports on my computers loosely. Once during my testing I moved a 3.5-inch drive a couple inches, without much force, and the Adapter lost its connection. But if you aren't moving drives around during use—which you shouldn't be anyway—this won't be a major concern. I also wish the Adapter’s AC power adapter was smaller. Everything else in the package is light and compact; if the power adapter wasn’t so large, you could easily throw the kit in your travel bag. In terms of performance, the new Drive Adapter is similar to the original. Which is to say that it isn’t as fast as a FireWire connection (or, of course, a direct IDE/ATA or SATA connection) but it’s competitive with an inexpensive USB 2.0 enclosure. The Drive Adapter is great for those who work in IT and have to do a lot of drive swapping and maintenance. It’s also a practical tool for the end-user who’s purchased a hard drive upgrade for a desktop or laptop Mac; you can plug the new drive into your Mac using the Drive Adapter, copy your files from your current hard drive to the new one (using a utility such as SuperDuper [or Carbon Copy Cloner]), and then swap the drives to be up and running. That summary holds true with the new version, and the new features—providing power to all drives for better compatibility, and the new status lights—are nice additions, even if the latter don't quite work the way I expected them to. I mentioned last year that the Drive Adapter is designed for temporary use; you don’t want to be frequently handling hard drives sans enclosures. However, if you do want to regularly use an unprotected drive, Newer Technology has introduced an inexpensive alternative to traditional drive enclosures. The company’s new ProtectaDrives, available for 3.5-inch hard drives ($10) or 2.5-inch hard drives ($8) are essentially silicone “skins”; you slip your drive into a ProtectaDrive and its bottom and sides are protected (the top is left exposed so the drive can cool properly). The corners of each ProtectaDrive feature thick, silicone bumpers for added protection, and the rubber material helps shield the enclosed drive from static and other electrical damage. The appeal of a ProtectaDrive is that it’s a very inexpensive accessory that, when combined with the Drive Adapter, lets you get good use out of older drives you have sitting around. 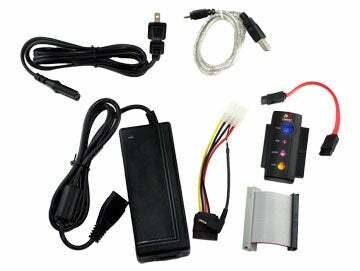 The USB 2.0 Universal Drive Adapter requires Mac OS 9.2 or higher or any version of Mac OS X.